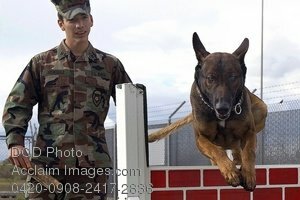 Description: Free, public domain image: Soldier Training a Military Working Dog. SIGONELLA, Sicily (Jan. 28, 2009) Master-at-Arms 2nd Class David Gutierrez performs training exercises with Rico, a Military Working Dog (MWD), at the obedience course at Naval Air Station Sigonella. MWDs fill an important role in the Navy by performing weapons, explosives and narcotics detection. (U.S. Navy photo by Mass Communication Specialist 2nd Class Jason T. Poplin.